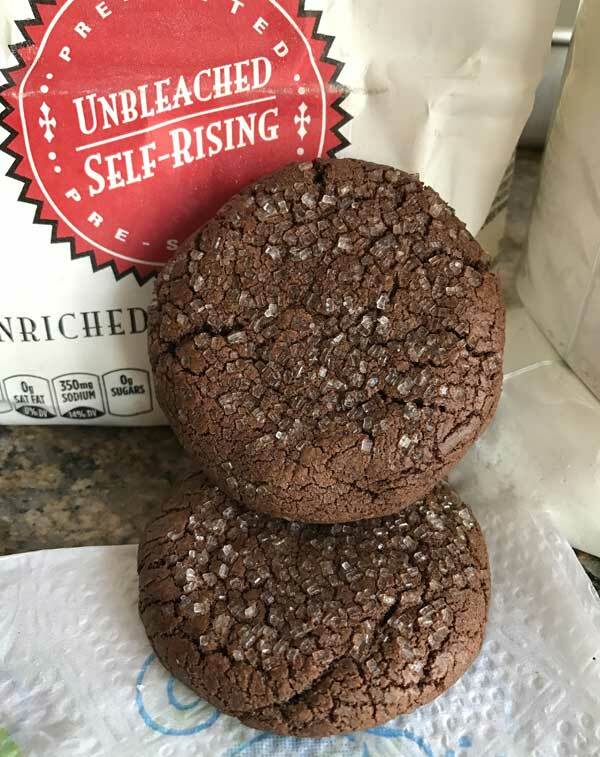 This recipe was a test to see how self-rising White Lily flour would work in a double chocolate cookie. Regular all-purpose flour mixed with baking powder and salt would have been just fine, but I wanted to see if the soft winter wheat used to make White Lily would have any impact on the overall result. The cookies were very nice looking and they did seem to have a better texture than chocolate cookies made with regular all-purpose. They had a thin shell with a fudge-like center and were fairly thick. The one in the photo was made with unchilled dough, but I made a second batch with dough that had been thoroughly chilled, and those were slightly thicker. Either way, both versions were excellent and this cookie will probably end up in my all-time favorites file. Melt 1 1/3 cups of the dark chocolate chips (8 oz) in a microwave-safe bowl at 50% power, stirring every 30 seconds until fully melted. Stir the cocoa powder and espresso powder into the melted chocolate and let cool slightly. In a mixing bowl using an electric mixer, beat the butter, salt (if using) and both sugars until creamy. With mixer on medium, add eggs 1 tablespoon at a time until incorporated, then beat for 1 minute. Beat in vanilla and melted chocolate mixture, scraping sides of bowl often. When chocolate is incorporated, stir in the flour. Make sure the dough is completely cool, then stir in the remaining 2/3 cup chocolate chips. Cover mixture and let sit until thickened. Preheat oven to 350 degrees F. Line 2 baking sheets with parchment paper or Silpats. Using a tablespoon measure, scoop up heaping tablespoons of dough and shape into balls. Arrange about 2 inches apart (6 to a sheet) on baking sheets. Press tops down slightly. Bake one sheet at a time on center rack for 10 minutes or just until cookies appear set. Let the cookies cool on baking sheets about 5 minutes or until set. For this batch I used Nestle brand Dark Chocolate Chips, which are a little larger than regular chocolate chips. I think Guittard Extra Dark or Ghirardelli Bittersweet chips would also work well. You could also combine the chips with some chopped dark or bittersweet chocolate, but the cookies *may* lose a little of their thickness. I've also made these with Ghirardelli Bittersweet chips. The dough is very thick and solid, but you should still be able to break it into chunks and shape it into balls. The bittersweet chips (which are 63%) will give you a less sweet cookie. 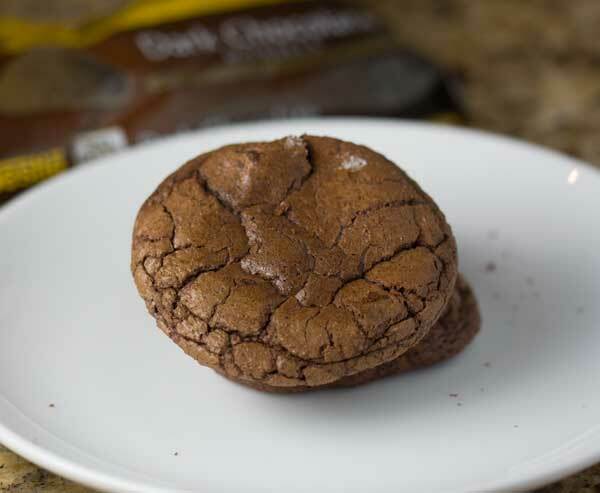 For a sweeter cookie, stick with dark chocolate or semisweet chips. I love cookies like this and can’t wait to try them. I haven’t had White Lily since leaving the south for Australia. I do miss that stuff. I think I need a snack… These look so delicious. Now I’m hungry! Wow, I’m constantly fighting the devil on my shoulder whenever I visit your blog! Those cookies look gorgeous. I can just imagine the soft, succulent fudge-like inside. Ay! Have you written about biscuits made with White Lily yet? I did a quick search and didn’t see any posts, but I might have missed it. I’d love to hear your take on them compared to biscuits with AP flour. I’ve never used White Lily. They sound worthy of trying if they’re going to end up in your all time favorites file.